Our old ones were green/white roman blinds with a checked valance - glimpsed here. Made by the former owner. 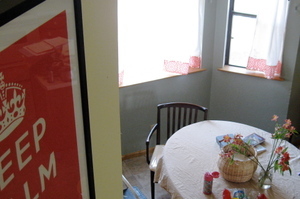 (By the way, I'm keeping it real here, by not clearing off my table - click on the photo to see notes in flickr). 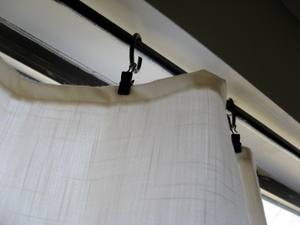 I used a linen blend fabric for the top of the curtain panels - I wanted it really washable - good thing, as I was sewing them up I noticed that someone had touched all the panels with chocolatey fingers! The bottom fabric is Amy Butler Lotus, in Cherry. 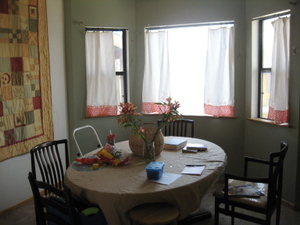 My next project will be making a kitchen curtain (smaller window) entirely out of that fabric - it'll be cheery. 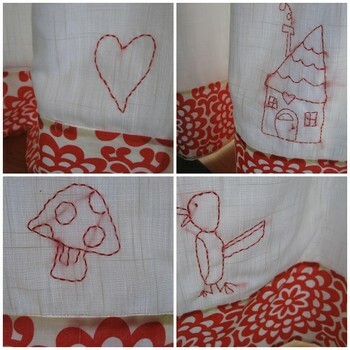 I made four panels, and each has a little embroidery design. I wasn't nearly neat enough with my threads on the back, but oh well. The house is a collaboration by Princess and I. The bird is from a drawing she made for my birthday. 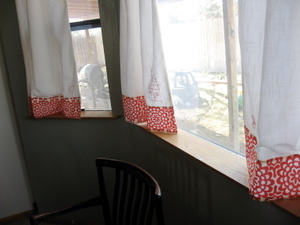 I originally wanted cafe curtains - only 2/3 the way up the window, but we get major sun in the afternoon, so I made them full-length. They're attached by clips/rings, which also makes them really easy to open/close. I'm pretty excited that they turned out - especially as I made them up as I went along, lined them, and I'm horrible at measuring. I'm liking them! They're lighter and more 'spring-y'. More fun, and definitely more me than our old ones! p.s. - We've had quite the cloudy/gloomy day today - not ideal for taking photos. And, of course, now that I've posted these photos, the sun came out! DOH!